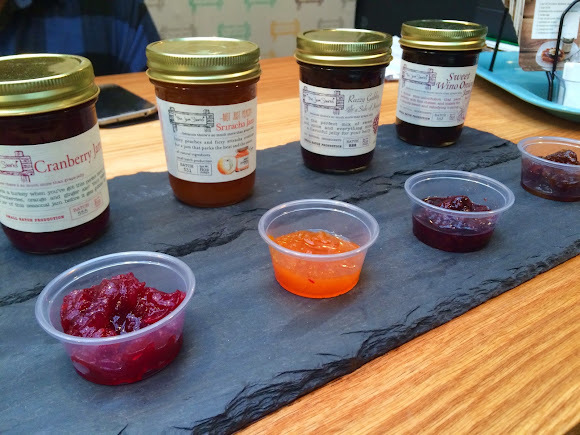 Jenna from the executive office explores the wild side of jam (and even bakes with it!) at Bank of America Winter Village. I am normally not one to get excited about jam. Due to my limited interest and lacking knowledge about jam, I was very intrigued when I found out that the winter village at Bryant Park was featuring a jam stand. The Jam Stand (kiosk H5) is not your ordinary jam stand with classic yet unoriginal flavors like strawberry, blueberry, and raspberry. This jam stand is way more sophisticated than that. The jams in this stand have magical names, like “Razzy Gabby & a Side of Jalapeno” and “Drunken Monkey.” YUM. Guess I’d missed the memo that jam is no longer just that stuff you spread on your English muffins and toast. It’s much, much more than that. It’s a sauce for your burgers, a topping for your ice cream, or even a filling for your pie. Not sure which jam to purchase? Sample multiple flavors. After trying some on the shop's signature flavors, I decided I wanted to purchase one of these crazy little jars and try to make something with it. I was very torn between a sweet jam and a savory jam because I like all food and all of the jams were so unique. In the end my sweet tooth won out and I decided on the “Chai Heart Pumpkin” flavor. After purchasing my delightful little jar I was told to check out the Jam Stand blog for some delicious recipes featuring the jam I'd purchased. This is great for anyone looking for a way to incorporate the jam into an actual meal with tried and tested recipes. These pumpkin bars made with Chai Heart Pumpkin jam were easy to make and a huge hit in the Bryant Park executive office. 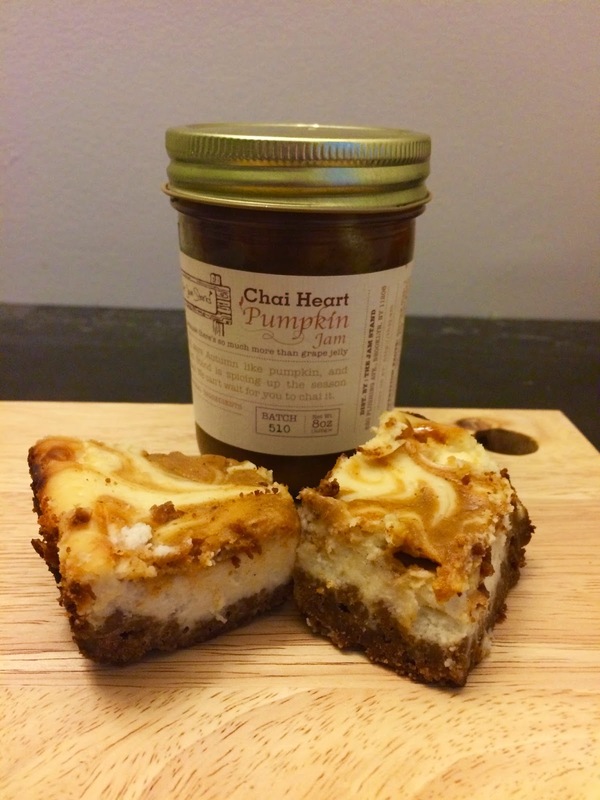 Keeping in line with my sweet tooth, I decided to try the pumpkin bars featuring the Chai Heart Pumpkin jam. The recipe was easy to follow and simple to make. After eagerly waiting for the bars to bake and cool, I was finally able to try one. IT WAS INCREDIBLE. The jam added the perfect touch of spicy pumpkin to the sweet, delicious bars. They lasted about two days (I shared them with all of my co-workers who couldn't get enough). The blog recommends some great recipes for all of the jams, like using the Drunken Monkey on waffles or pancakes, and using the Sweet WINO Onion on your turkey sandwich. Although the Jam Stand doesn’t have a store dedicated just to their jars, you can find them throughout the city or currently at the Bryant Park Winter Village. If you don’t know what jar to get, I’d suggest getting one in every flavor.